If you have been involved in an accident that results in an injury that was not your own fault, whether in a supermarket, shopping mall or shop you are likely to suffer from shock as well as the injuries above. According to the Occupiers’ Liability Act of 1957, there are strict rules that businesses are legally obliged to follow to ensure you are as safe as you can be while on their properties. If the manager or owner of a shop of any kind has been negligent when it comes to following these rules; they may be responsible for your injuries and you may be eligible to claim compensation from them. No-one deserves to suffer because someone didn’t do their job properly and very often injuries of the sort mentioned above can cause problems in your day to day, particularly with your finances. If you are looking to make a personal injury compensation claim for an accident that happened while you were shopping, that wasn’t your fault, you need to seek the help of a personal injury lawyer as soon as possible. Shopping centres, supermarkets and shops are generally safe places to be. However, this does not mean that serious accidents causing severe injuries cannot happen as a result of health and safety regulations not being followed properly. This could happen because members of staff have not stacked the shop’s shelving in a safe manner, causing accidents involving falling objects. It could also be that signs hung from the ceiling are not secured properly and therefore fall and cause injuries. The majority of injuries are accidental and have been caused by oversight in a certain area. Fittings like shelving often have very sharp edges that can cause cuts, and broken objects not disposed of or repaired can also cause injuries such as cuts. Another all too common kind of accident that can happen in a shopping setting are slips, trips and falls. These are often the result of slippery or wet floors where the appropriate ‘wet floor’ signs are used. Floors are often wet for a number of different reasons, whether it is spillages, cleaning or weather. 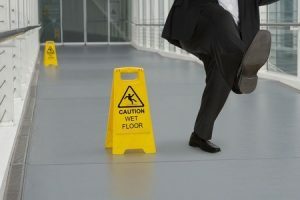 Whatever the cause of the wet floors, it is the responsibility of the owner or manager of a shop to dry the floor as soon as they can and ensure that warning signs are used. When drying a floor, no cleaning detergent should be used on the mop as this could make a bad situation worse. Trips and slips are also often caused as a result of packaging, boxes or similar items left on the floor of aisles, as well as stairs or flooring that is in bad condition. It is the duty of the establishment owner to arrange where boxes and deliveries will be placed, that flooring is adequately maintained and that stairs have appropriate handrails. Restaurants and fast food outlets with fryers should also pay special attention to grease which may accumulate on the floor during their hours of service, and work to combat that effectively for the good of staff and customers. How Can Compensation Help You? Although the reality is that there is no amount of money that can reverse what has happened to you as a result of your shopping accident and subsequent injuries. However, as any personal liability lawyer will tell you, the money you can win with a successful compensation claim can help you live a more comfortable life. For example, you may have had to take sick leave from work, with no pay at all or pay that is considerably reduced. This obviously has a huge impact on your finances. It can be a lot to manage, dealing with the stress and painful injuries you may be suffering from, as well as the financial pressures. Particularly as you may have a physiotherapist and other medical treatments to spend money on. A personal injury lawyer will be able to look at your shopping accident in greater detail, considering all important aspects to help you get the compensation you deserve. How Do You Make A Shopping Accident Compensation Claim? Although it may feel overwhelming and you may be anxious about getting in touch with a personal injury firm or individual, it is one of the first things you should do to get the money you deserve. With most law firms and lawyers, you are not obligated to hire them if you seek out a quote and most operate on a ‘no win, no fee’ basis. They will be able to help determine your best course of action. It is important to give them as much information as you can about your accident, including the details of what the shop manager or owner did when the accident occurred if there were eyewitnesses, any photographs you took and anything else relevant. Personal injury compensation claims are never easy and can be quite tricky; with the help of a professional solicitor, particularly one with experience of this kind of accident and case, it is possible to do it and win. It is crucial that you don’t delay though, as there is a time limit on how long you have to legally put forward a claim for compensation. This is normally three years after the accident happened or negligence was acknowledged.